ASHLAND, Ore.– The first all-girl Scouts BSA troop in southern Oregon will be welcoming new members into its ranks on Monday as Ashland’s Cub Scout pack 112 celebrates scouts moving from the pack into their troop. For two girls, Payshens Cichy and Coral Weston, it’s a momentous occasion and on top of it, both will be receiving the highest honor a Cub Scout can attain. Known as the Arrow of Light, it signifies a cub scout’s dedication and work ethic to help others and be an active part of the program. As the two girls transition or “bridge” as it’s called over to Troop 211, the all-girl troop, Payshens shared what it took to get to this point. 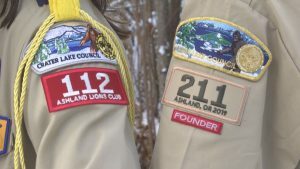 Payshens and Coral will now join several other girls in the Rogue Valley that have received this award but they’ll have the distinguished honor of being able to join Troop 211 as well. For Payshens, it’s a moment she’s been preparing for some time. “Like the scout law, it’s trustworthy, loyal, helpful, friendly, courteous, kind, obedient, cheerful, thrifty, brave, clean and reverent,” she said, listing off all of the laws taught in Cub Scouts. But being a part of the Cub Scouts and Troop 211 isn’t just about the skill sets it offers, Payshens says it’s a chance to be with her family, all of which are a part of Scouts BSA in some way. Her sister Chyna will also be joining her as part of Troop 211 and her two younger brothers are going through Cub Scouts at the moment, getting ready for their turn to join the all-boy troop Troop 112 when they can. Her father, Cody Taylor, described what it was like not just for their family but what other families were seeing as well. Along with her four siblings, Payshens is excited for the next part of her scouting journey and reaching the loftiest of ranks as potentially one of the first female Eagle Scouts in southern Oregon.